Wendy's P55 BBQ Value Promo is back! 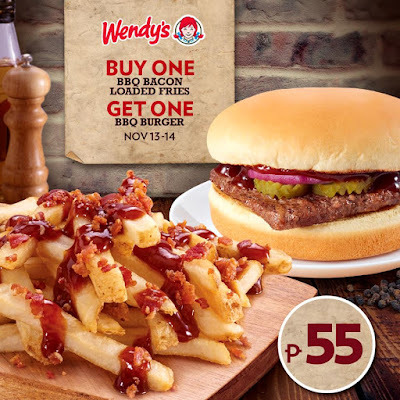 Buy 1 (one) Wendy's BBQ Bacon Loaded Fries, and Get 1 (one) Wendy's BBQ Burger for FREE! This promo is available on November 9-10, and on November 13-14, 2017 in all Wendy's stores except NAIA 3. For dine-in and take-out transactions only.